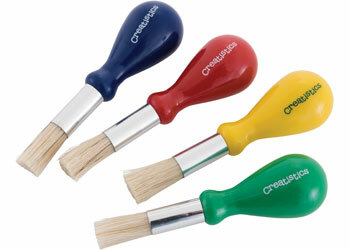 Stubby paint brushes by Creatistics. Each paint brush is 11cm long. Supplied in assorted colours including blue, green, red and yellow. Pack of 12. 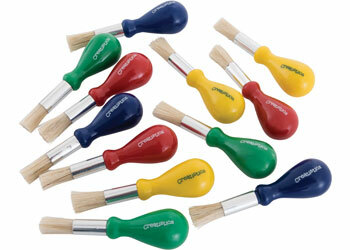 The paint brushes are ideal for little hands in the early grasping stages to hold and work with. Their round handle ensuresyounger years are able to grip and hold these brushes comfortably, allowing children to move the brush over the paper with ease. Painting is a terrific way for children to explore creativity and imagination, as well as provide a powerful means of communication. Through art, children are able to express their thoughts, feelings, ideas and things of importance to them in ways they can’t always express with words. Painting with stubby brushes is also a great way for the early years to develop fine motor skills and independence. Fine motor skills are essential for performing everyday tasks including self care- the working of zips, buttons and laces. Strength, control and dexterity of fine motor skills also helps children to hold and manoeuvre pens and pencils on the paper, as well as manipulate tricky construction and building tools. Fine motor skills also helps children during art and craft activities, holding brushes, working scissors, picking up and placing collage items and so much more. 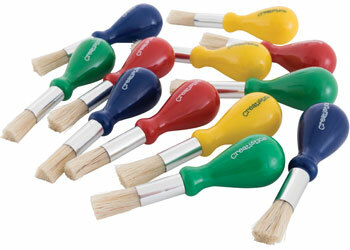 The assortment of coloured brushes can brighten up the art experience, as well as provide an option for colour coding and matching with various coloured paints.